CBI - China: Day 27 of 154 of the Japanese Invasion of Manchuria. 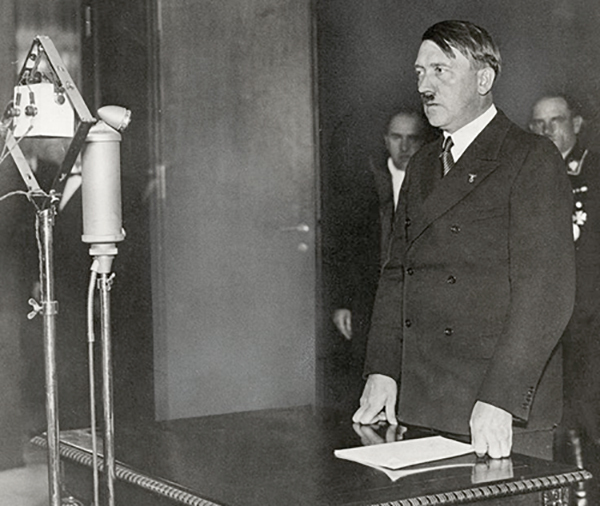 Germany: Hitler announces Germany's withdrawal from the League of Nations and renounces its role in the Disarmament Conference at Geneva, opening the door to a vast military construction program. In a radio address from Berlin, Adolf Hitler announced the withdrawal of Germany from the League of Nations, which Josef Goebbels described as "a congregation of dead people." Behind Hitler, the man in uniform on the right is Sepp Dietrich, chief of Hitler's SS bodyguard and later a prominent Waffen SS general. The League of Nations had been a paper tiger from its inception. Toothless and unbalanced in representation, the League's success was limited to isolated cases of economic sanctions and mediation. Hitler witnessed the League's humility firsthand when Germany assisted Italy's takeover of Abyssinia in October 1935 as the world community stood by passively. Of course, the major problem of the League from its inception had been the lack of participation by the United States. The Geneva Disarmament Conference, beginning in 1932, sought to avoid another European war by negotiating a reduction in armaments. With this renunciation, Nazi Germany will embark on its vast military construction program. When the League was born in 1919, Germany was not permitted to join because it was seen as having been the aggressor in the First World War. But when Germany was admitted to the League of Nations on 08 Sep 26, it was made a permanent Member of the Council. This was seen as a positive step toward rebuilding Germany from the devastation and chaos it faced at the end of World War One. Spain: Day 90 of 985 of the Spanish Civil War. Spain: Day 455 of 985 of the Spanish Civil War. CBI - China: Day 100 of 2,987 of the 2nd Sino-Japanese War. Day 63 of 106 of the 2nd Battle of Shanghai. Day 44 of 70 of the Battle of Taiyuan. Spain: Day 820 of 985 of the Spanish Civil War. CBI - China: Day 465 of 2,987 of the 2nd Sino-Japanese War. Day 126 of 139 of the Battle of Wuhan. Day 3 of 81 of Japan's Operation GUANGDONG. Atlantic: German U-47 sinks HMS ROYAL OAK at anchor in Scapa Flow, killing 883. CBI - China: Day 830 of 2,987 of the 2nd Sino-Japanese War. ETO - UK: Day 39 of 258 of the Blitz. ETO - UK: Day 97 of 114 of the Battle of Britain. East Africa: Day 127 of 537 of Italy's East African campaign in the lands south of Egypt. CBI - China: Day 1,196 of 2,987 of the 2nd Sino-Japanese War. Day 335 of 381 of the Battle of South Guangxi. CBI - Thailand: Day 14 of 221 of the Franco-Thai War (Vichy France vs Thailand). Russian Front - Finland: Day 108 of 142 of Operation SILVER FOX, a joint German-Finnish campaign to capture the Russian port of Murmansk in the Arctic. Russian Front - Finland: Day 106 of 140 of Operation ARCTIC FOX, a joint German-Finnish campaign against Soviet Northern Front defenses at Salla, Finland. Russian Front - Finland: Day 115 of 164 of the Battle of Hanko. The Soviets will be forced off their leased naval base. Russian Front: Day 115 of 167 of Germany's Operation BARBAROSSA. Russian Front - North: Day 37 of 872 of the Siege of Leningrad. Russian Front - Center: Day 13 of 98 of the Battle of Moscow. German Army Group Centre wipes out the Soviet pocket at Bryansk, Russia. Russian Front - South: Day 68 of 70 of the Siege of Odessa, Ukraine. Soviet troops fall back in southern Ukraine as the German Army Group South make for the port of Rostov. MTO - Libya: Day 188 of 256 of the Siege of Tobruk. East Africa: Day 492 of 537 of Italy's East African campaign in the lands south of Egypt. CBI - China: Day 1,561 of 2,987 of the 2nd Sino-Japanese War. Russian Front - North: Day 402 of 872 of the Siege of Leningrad. Russian Front - North: Day 163 of 658 of the Siege of the Kholm Pocket, USSR lays siege to the Kholm Pocket but the Germans hold out for a about a year and a half. Russian Front - South: Day 109 of 150 of Germany's CASE BLUE, the failed offensive to take the Caucasus oil fields. Russian Front - South: Day 53 of 165 of the Battle of Stalingrad, bloodiest battle in human history. MTO - Egypt: US P-40s fly patrols between El Alamein and Burg el Arab. MTO - Libya: US B-17s hit shipping at Tobruk. East Africa: Day 163 of 186 of the Battle of Madagascar. CBI - China: Day 1,926 of 2,987 of the 2nd Sino-Japanese War. PTO - Alaska: Day 130 of 435 of the Battle of Kiska, Aleutian Islands. The US and Canada will defeat the Japanese invaders. PTO - Malaya: Day 238 of 357 of the Battle of Timor Island, a long guerrilla war ending in Japanese victory. PTO - New Guinea: Day 86 of 119 of the Battle of the Kokoda Track. The Australians continue pushing back the Japanese troops. PTO - Solomon Islands: Day 69 of 187 of the Battle of Guadalcanal. At night the Japanese bomb Henderson Field and come morning send troops ashore. US planes counter-attack. ETO - Germany: US 8th Air Force sends 251 B-17s to bomb ball bearing factories in the Second Raid on Schweinfurt, said to be the greatest air battle in history and a very costly mission known simply as Black Thursday. For hundreds of miles in-bound to the target area, the B-17 bomber formations were attacked again and again by untold numbers of Luftwaffe fighters. Despite the horrible spectacle of B-17 after B-17 falling earthward to destruction, those bombers that were still able to fly never wavered from their course. After releasing their bombs, the Flying Fortresses turned around and headed westward for England and their bases. Almost immediately the German fighters, having landed and refueled, struck again, forcing the B-17s once more to fight for their survival as they had done in-bound to the target area. Finally, the heavy bombers reached the coastline of Europe and relative safety, although many of them were so heavily damaged that they would never fly again. In the final tally, the 8th Air Force reported that of the 251 B-17s that had departed on the mission, 60 had failed to return, five had crashed in England because of battle damage, 12 had to be scrapped because of crash landings or battle damage and 121 had to be repaired before being flown again. Worse yet, 600 men were lost over enemy territory and there were five dead and 43 wounded fliers in the B-17s that did return. The bombing took a fearful toll in Schweinfurt, killing 276 Germans, mostly civilians. All five ball-bearing factories had been hit, and Allied commanders at first labeled the raid a success. Only after the war did they learn the damage to the machines producing the bearings had been limited, and production quickly bounced back. 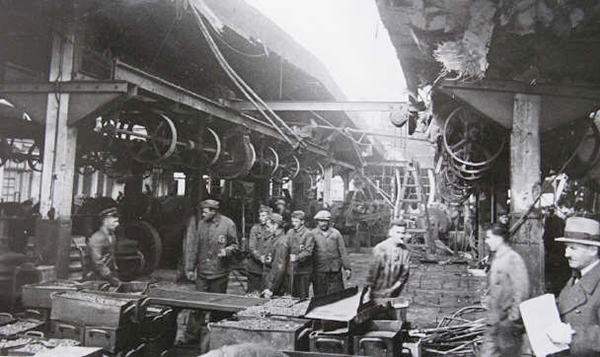 The Nazis scattered the factories around the country, so there would be no crippling blows in the future. 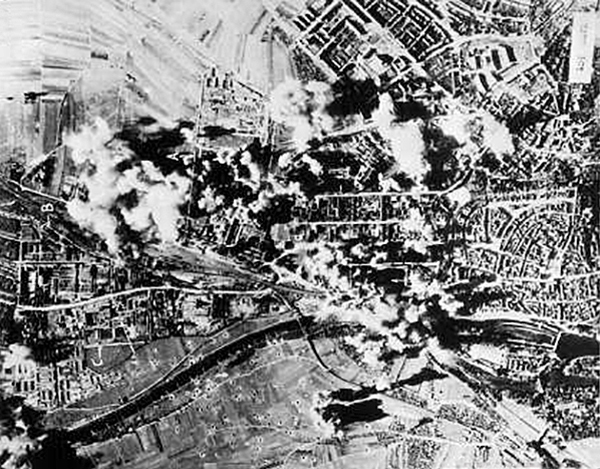 Schweinfurt was bombed a total of 22 times by 2,285 aircraft during WWII, including attacks by the US 8th and 15th Air Forces, night bombing by the British Royal Air Force, and a final tactical attack by the 12th Air Force on 10 Apr 45, the day before the US Army took the city. Black Thursday furnished final and terrible evidence of the perils of unescorted daylight bombing attacks against German industry. A planned follow-up raid had to be postponed to rebuild American forces. ETO - Germany: Massive escape from Sobibor as Jews and Soviet POWs break out, with 300 making it safely into nearby woods. Of those 300, fifty will survive. Russian Front - North: Day 767 of 872 of the Siege of Leningrad. Russian Front - North: Day 528 of 658 of the Siege of the Kholm Pocket. USSR lays siege to the Kholm Pocket but the Germans hold out for a about a year and a half. Russian Front - South: Day 52 of 122 of the Battle of the Lower Dnieper River, USSR. Zaporizhia is liberated by the Russians. MTO - Italy: US 12th Air Force and RAF fly air support for the ground troops. CBI - China: Day 2,291 of 2,987 of the 2nd Sino-Japanese War. PTO - New Guinea: Day 26 of 219 of the Battle of Shaggy Ridge. PTO - New Guinea: Day 23 of 162 of the Battle of the Huon Peninsula. Will result in an Allied victory. Germany: Field Marshal Erwin Rommel is forced to commit suicide after he is loosely implicated in the 20th July Bomb Plot against Hitler. For a time, Erwin Rommel was Hitler's favorite general. But by the beginning of 1943, Rommel's faith in Germany's ability to win the war seemed to be crumbling, as was his estimation of Hitler. 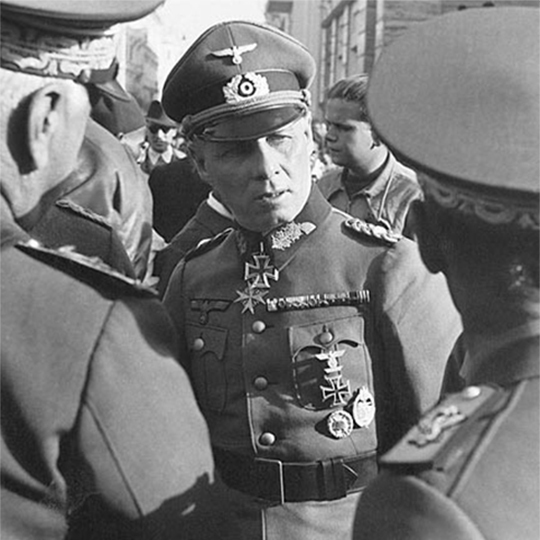 Touring Germany, Rommel was appalled at the devastation of the Allied bombing raids and the erosion of the peoples' morale. He also learned for the first time of the death camps, slave labor, the extermination of the Jews and the other atrocities of the Nazi regime. It is said that Rommel became convinced that victory for Germany was a lost cause and that prolonging the war would only lead to his homeland's utter destruction. In the gory reprisals that followed the attempt to kill Hitler on 20 Jul 44, some suspects implicated Rommel in the failed bomb plot. Although he may not have been aware of the attempt on Hitler's life, his "defeatist" attitude was enough to warrant Hitler's wrath. The problem for Hitler was how to eliminate Germany's most popular general without revealing to the German people that he had ordered his death. The solution was to force Rommel to commit suicide and announce that his death was due to battle wounds received on 17 Jul 44 when a British aircraft strafed his staff car, severely wounding him. ETO - France: Day 75 of 284 of the Battle of Brittany. ETO - Belgium: Day 43 of 62 of the liberation of Belgium. ETO - Belgium: Day 13 of 38 of the Battle of the Scheldt Estuary. ETO - France: Day 30 of 236 of the Siege of Dunkirk. ETO - Germany: Day 26 of 145 of the Battle of Hürtgen Forest. Russian Front - Finland: Day 30 of 223 of the Lapland War. Finland and Russia have joined forces to kick the Germans out of Finland's most northern province. Russian Front - Finland: Day 8 of 23 of the Petsamo-Kirkenes Offensive. The Soviets will drive the Germans out of the Arctic region in northern Scandinavia. Russian Front - North: Day 31 of 41 of the Battle of Riga, Latvia. Russian Front - Center: Day 31 of 72 of the Battle into East Prussia and northern Poland. Russian Front - Center: Day 10 of 18 of the Battle of Memel, a border town of Lithuania and East Prussia. The Germans continue to hold the Niemen line to cover East Prussia. Russian Front - South: Day 9 of 24 of the Battle of Debrecen, Hungary. Russian Front - South: Day 31 of 72 of the Battle of Belgrade, Yugoslavia. Soviet troops and local Partisans force their way in to Belgrade. MTO - Italy: US 12th Air Force fighters attack targets south of Bologna. MTO: US 15th Air Force B-17s and B-24s bomb in Germany, Hungary, Czechoslovakia and Yugoslavia. MTO - Greece: The British liberate Athens and Piraeus and also land troops on Corfu. CBI - Burma: Day 197 of 302 of the Chinese Salween Offensive in Burma. CBI - China: Day 2,657 of 2,987 of the 2nd Sino-Japanese War. Day 181 of 259 of Japan's Operation ICHI-GO. PTO - New Guinea: Day 305 of 597 of the Battle of New Britain. PTO - New Guinea: Day 176 of 481 of the Battle of Western New Guinea. PTO - Palau Islands: Day 30 of 74 of the Battle of Peleliu (Operation STALEMATE II). PTO - Palau Islands: Day 28 of 36 of the Battle of Angaur. Southeast Asia: French troops begin fighting in Vietnam. USA: "Galloping Gertie," the bridge that collapsed into the Puget Sound on 07 Nov 40 in one of history's worst engineering disasters, is reopened over the Tacoma Narrows and is nicknamed "Sturdy Gertie." The true story of five brothers who fought and died together when their ship was sunk in the South Pacific; the movie that inspired "Saving Private Ryan."